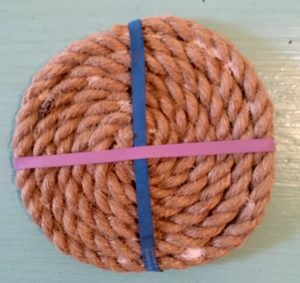 Bring a coastal feel to any space with these super easy to make DIY sisal coasters! 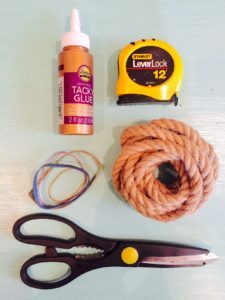 Wrap them up and tie a bow around them for a quick and fun hostess gift. 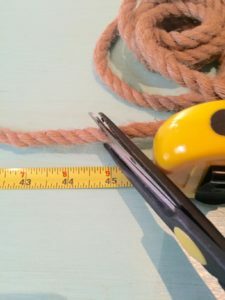 What you'll need: Spool of sisal rope Craft glue Scissors 4 rubber bands Measuring tape Hands on time: 5 minutes/ coaster Dry time: 3-4 hours Level of difficulty: easy Measure sisal rope to 45 inches and cut at an angle. This will make a coaster with a diameter of 4.5 inches but feel free to go bigger! 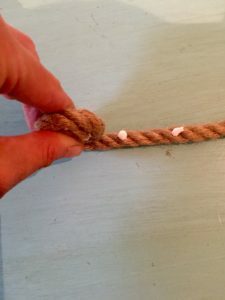 Squeeze a generous line of craft glue onto the end of the rope and begin to coil the rope. Once you have the first coil or so, you can begin spacing the glue dots about an inch apart. 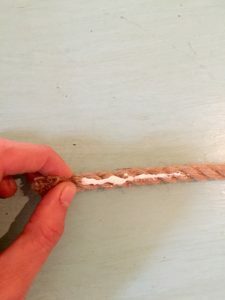 Roll sisal rope until you get to the end and then apply another generous helping of craft glue to the end of your rope and hold in place for a few seconds. Place rubber band across the coaster and make sure the freshly glued end is secured under the first rubber band. Place the second rubber band in the opposite direction making a cross with the two rubber bands. The third and fourth rubber bands go diagonally. Take a moment to check out the shape of your coaster and do any reshaping of its not to your circular liking. Let coaster dry for four hours, or more if you've got time. Be patient! Pro tips: Don't panic if the glue looks messy as you are coiling your coasters, it's dries beautifully clear. 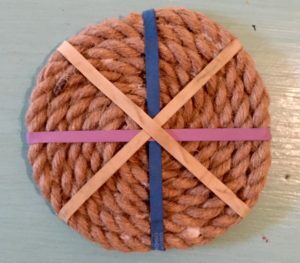 Trim any frayed or uneven ends after the coasters have dried. 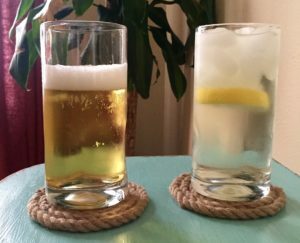 Now, Pour yourself a cold beverage and relax knowing your DIY sisal coasters have got your table tops covered!